Hands deserve daily pampering, just like the body and face. 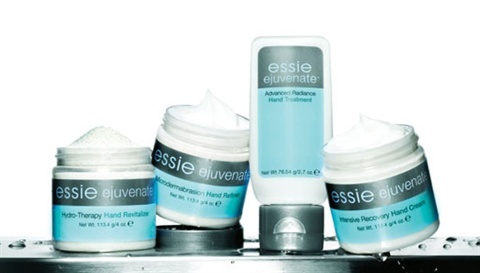 That’s why Essie has introduced ejuvenate — a comprehensive luxury hand treatment system that helps to combat signs of aging and reveal new, younger looking skin. The unique facial-grade formulas utilize spa techniques and spa-grade ingredients working in harmony to achieve noticeably younger looking hands. > Arginine is an amino acid that helps to increase skin elasticity. It is also a powerful skin humectant with antioxidant properties. > Licorice root extract helps to brighten pigmentation without irritating the skin and helps to reduce the appearance of age spots over time. > Rice extract is known to increase sirtuin activity to help promote cellular longevity, improve the skin’s barrier function, and restore the ability of aged cells to adapt and thrive. > Vitamins A and C improve the skin’s texture, firmness, and smoothness, while their antioxidants fight free-radical damage to protect the skin from premature aging. > Glycolic acid helps to even skin tone and lighten hyper-pigmentation. For more information, go to www.essie.com.